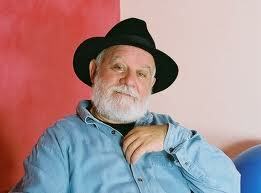 Iakovos Kambanelis, poet, playwriter and lyricist, passed away today at the age of 89. The late Iakovos Kambanelis was one of the most loved and respected Greek writers of the 20th century whose work reflects the life and tribulations of Greek society in the last century. We owe his work to his failure as an actor. A survivor of the Mythausen concentration camp in Austria he wrote the lyrics of the Ballad of Mythausen which Theodorakis set to music. During the same period he wrote unforgetable plays like “He and his trousers”, “A tale without a name” and “Our great Circus” which was performed during the Junta dictatorship and was an inspiration of resistance. The play’s songs performed by Nikos Xylouris are still sang by young and old. Some of the best Greek films of the period were written by him. “Stella” performed by Melina Merkouri is the best known of his scripts but he wrote many others quite as great and memorable. His heroes, both in his plays and scripts, are genuine and universal, real life people who become etched in your memory. He will always be alive through his work and respected for his talent. According to a report presented in “NEA” newspaper the new legislation submitted by the Ministry of Labour will include a clause which reduces to 50 from 100 the working days coupons necessary for a worker or unemployed person to receive free health services in 2011. This development paves the way for a positive prospective for all the working and unemployed people in Greece. At a time of increasing unemployment, when the working people live in constant insecurity it is very important to know that they and their families are covered health wise with as little as 50 days work. One more proof that collective struggles pay off and that immigrants and local workers should work hand in hand because they share common interests. This small but significant victory nulls the efforts to “divide and rule” of the government, the mainstream media and the extreme right arguments. The common struggles of Greek and immigrant workers will continue. At the same time, the greek working people should remain alert that this legislation passes and is implemented. Greek Defense Minister assures: Greece takes no part in operations outside the NATO alliance framework. Among other things he states: “As we have repeatedly said Greece is not participating in the military operations that take place outside the NATO framework”. The interview ended with a reiteration of the Greek Prime Minister’s position for a diplomatic initiative and a peaceful solution. Keeping a blog of what is going on in Greece seen from a native’s perspective is becoming more demanding daily. As a journalist in a local newspaper I had a very limited view of everyday activities in the whole of Athens, leave alone Greece. Now, I discover new items everyday and this is exciting and a full time job if done properly. 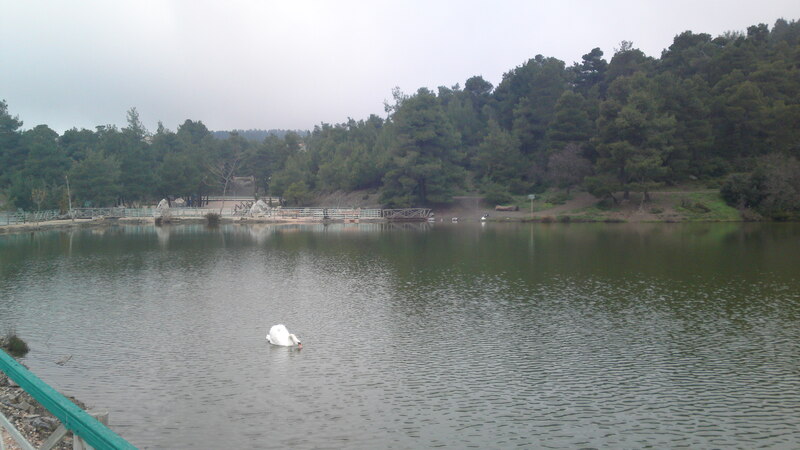 For example, in my efforts to find out interesting and exciting spots around Athens I drove over to Lake Beletsi. It was mentioned in an article about undiscovered beauty spots around Athens so I decided to visit it and searched my map. Lake Beletsi ( rather a small lake I should warn you) has the honour of being situated on Mount Parnitha. Parnitha was the favourite mountain of the budding nature loving movement, later to be christened “ecological”, back in the late ‘50s –early 60s. Close to Athens and luxuriously green it invited hikers and climbers alike. Later on it became quite notorious as the site of the Mont Parnes Hotel and Casino, the first Casino in Greece. 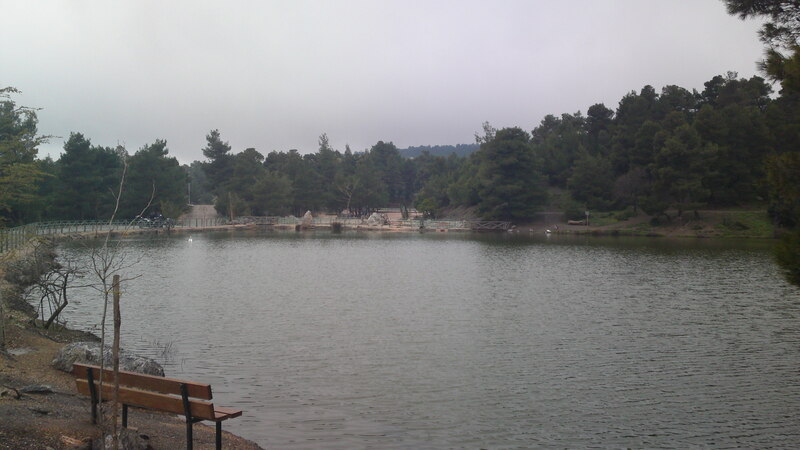 Lake Beletsi is tiny really but situated in a splendid spot, surrounded by a forest. It boasts a swan (I only saw one anyways), a couple of ducks and geese and an enclosed area hosting some deer rescued by the locals after the fire of 2007. You can feed the ducks and walk in the woods to inhale some fresh air. On the way back to the south of Attiki, we drove through some scenic routes and finally ended up on the Athens – Thessaloniki highway. We were surprised to find a very heavy traffic as the day was not a particularly good one: cloudy, cold and rainy. Then we noticed that all the cars around us had their alarm lights on and some of them were hooting without any obvious reason. Then we saw the tolls and the cars driving through without paying and we understood. It was the weekly protest drive of the inhabitants of Oropos, a seaside resort turned to an Athens suburb, who have to pay tolls 8 times within the limits of one region!! 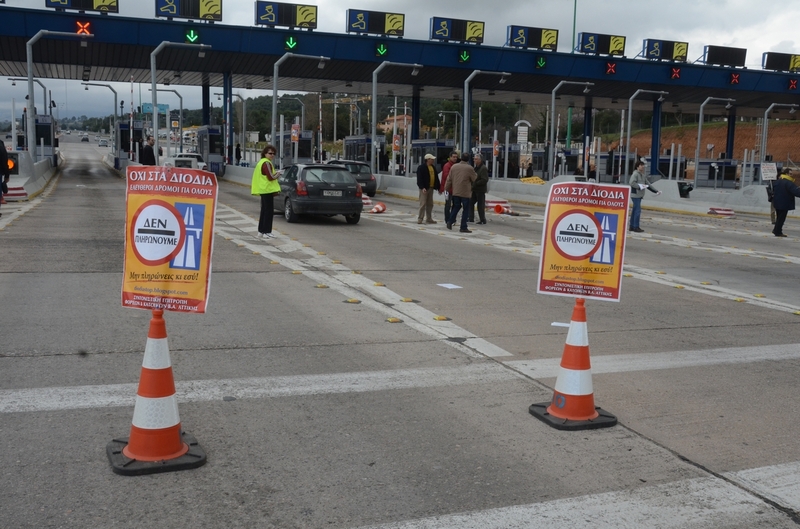 So, they joined the “I don’t pay, I don’t pay” movement and stop people from paying the tolls. The movement, accused by the government of inciting people to disobey laws, has become very popular given the state of the Greek highways: in 2010-2011 alone the Athens Thessaloniki highways was closed for weeks, first because of landslides and then because of flooding. The Athens – Patras highway, to the south, has no dividing fence and is a real death trap. The public, finding themselves paying again and again for goods or services not delivered are quite sympathetic as we witnessed ourselves. Our Sunday drive to Lake Beletsi was both educational and dirt cheap!! The European Union and the United States in a coalition with Arab States have started air attacks on Libyan targets in order to enforce the UN resolution for the protection of Libyan civilians. Russia has stated its concern over the decision while Canada has agreed to assist. The Greek government agreed with the UN resolution but stated that it will only participate in humanitarian operations. Greek left wing parties have condemned the attacks claiming that the “barbarity of the Ghadaffi regime cannot be countered and dealt with through the aggression of a NATO plans”. Such plans are against the peaceful coexistence of the Mediterranean countries and the democratic processes that have started in some North African countries. Even the right wing xenophobic LAOS has stated that no Arab has ever killed by a Greek rifle and it should not happen now. The concern is emphasized due to the Souda NATO base in Crete which is quite close. 25 years after Chernobyl we are reminded, by nature this time, that there is no safe nuclear energy. Besides the unceasing, dormant but very real danger of nuclear waste which is dumped mainly in the developing world we are forced to face the reality that nuclear plants cannot be totally safe. We knew the human factor element that can cause accidents, in Japan we saw a natural disaster trigger off a nuclear accident. The reaction of European countries which rely on nuclear energy to close -even for three months- the older of their nuclear plants adds to the arguments against nuclear energy and for renewable forms of energy. Greece is unfortunately situated too close to Bulgaria and the admittedly outdated Kozlodui plant but also to Turkey whose plans for a nuclear plant in Akkuyu, an earthquake prone area, are opposed by the Turkish ecologists as well. It is time to press for more research on renewable forms of energy. The anti nuclear movement is strong and can become stronger by cooperating with scientists looking for new and renewable energy sources. Manolis Rassoulis, one of the most popular musicsmiths and performers of modern Greece was found dead in his apartment in Thessaloniki where he lived for the last 20 years. A deeply political being, he left Greece during the dictatorship and on his return he performed for some of the greatest composers and wrote lyrics for them. When he started writing his own music and lyrics was the time he was recognized by the people as “one of us”. Lyrics that at first did not make sense touched the Greeks to the heart and his music seems to tickle your toes for a zembekiko. He had no taboos about music – his songs ranged from the political to the comic and were always entertaining. We shall miss his honest approach at a time when we have to choose between the profane and the pompous.